If you've been noticing quarter sized black spots on the neighbourhood maple trees recently, you are not alone. The unsightly spots found on our National trees are commonly known as Tar Spot and is cause in part by our record breaking rainfall this past Spring. Despite the fact that the leaves have...as my young niece describes as "polka dots" on them, it does not cause permanent damage to established maple trees. 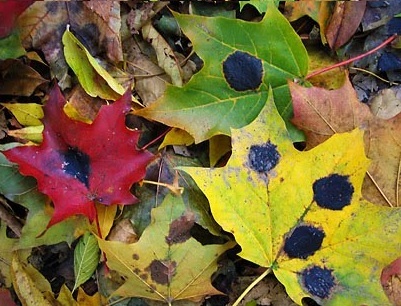 Tar Spot does however, survive the winter on leaves that have fallen and not been removed. Therefore, we can do our part to diminish this fungal disease from spotting up our trees next year, by raking up and removing the fallen leaves before the snow flies. For more information, take a look at the attached Toronto Parks & Recreation info sheet on Forest Health Care and the 'What to do about Tar Spot' article in Canadian Gardening.